Gordon Clitheroe, a long-standing volunteer at Beck Isle Museum in Pickering, has been shortlisted for the national Museums and Heritage Volunteer of the Year Award. Gordon has been a volunteer with Beck Isle Museum since its foundation in 1967, serving on the original management committee in roles from chairman to honorary curator. The founders took over a Georgian house, which had been divided into flats and began by using the ground floor and exterior for exhibitions and events. Gordon brought his skills as a qualified plumber and associated building skills, enabling him to play a key role in the team of volunteers who converted the Grade II* Georgian house into the Museum as it is today. Over recent years, Gordon has continued to be an anchor for the museum, with his vast knowledge of the history of the Museum and of Pickering and the surrounding district providing a unique source of information for volunteers and the Museum Manager. Gordon also uses this knowledge to give illustrated talks to community groups in the area. Gordon has produced six books illustrating the history of Pickering and district, and since 2014 has been leading a team which researched all those from Pickering who served during the 1914-18 War. In 2018 the second volume of this research: ‘Beck Isle Museum Remembers Pickering’s Returning Heroes’ was published, tracing the biographies of over 500 servicemen, and some women, who returned from the war. Gordon still comes into the museum most days and continues to use his skills helping to maintain the building, doing anything from clearing gutters and sweeping paths to liaising with contractors. He continues to play a formal role by serving as a trustee of the charity, but it is his outgoing nature, his generosity of spirit and his utter dedication to the Museum over the past 52 years that is an inspiration to everyone who knows him. 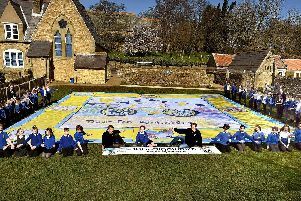 The school pupils whose art will be made into "the size of 2 double-decker buses" at Scarborough Castle !